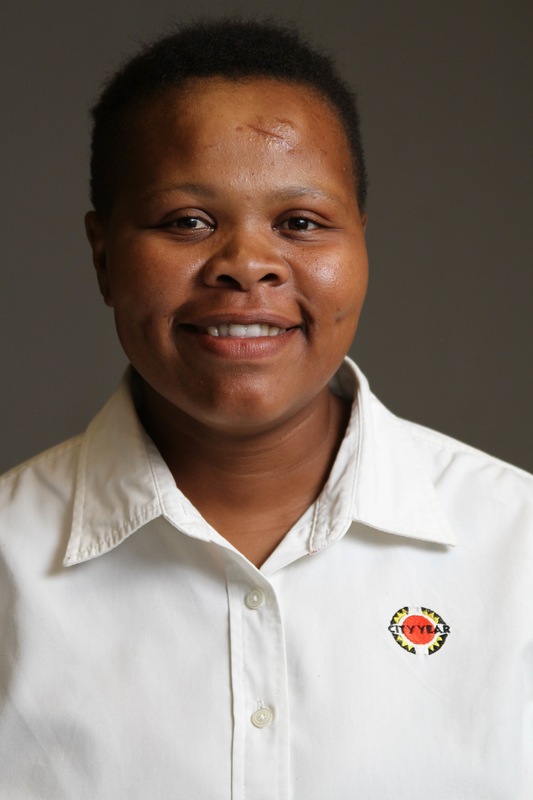 Born and raised in various parts of Jozi, Smash Shoyisa is another one of City Year South Africa’s incredible Site Leaders. Smash served in the 2006 corps, came back for a second year as a Senior Service Leader, and then rejoined the organisation a few years later in 2011 as a Site Leader, which is the position she has held until now. Smash, how did you hear about City Year, and what motivated you to join the organisation? I was part of an organisation called Youth AIDS in Dube, Soweto. We used to go to high schools to raise awareness about HIV/AIDS. In 2005, City Year came to Youth AIDS to recruit Service Leaders for the 2006 corps, and I was really drawn to the leadership development aspect of the organisation. I wanted to improve myself, and make myself a better leader. Why do you think that it’s important for young people to commit to a year of service? So that they understand what it means to be an actively engaged citizen. Programmes like City Year give you different perspectives on ways to give back to your country. People often complain about the government not delivering services, without realizing that they form part of the government. We all have a part to play to make our country better. The Muffinz – Have You Heard. I love listening to kasi music, by bands that are unsigned. What is your most memorable City Year moment? Participating in Crossing the Line during our Basic Training Retreat in 2006. Crossing the Line is a session that we do regularly across our network at City Year. A facilitator will read a number of statements out to a group, and without talking you have to cross a line on the floor if the statement is true for you, or stay where you are if it is not. It’s an incredibly powerful exercise that illustrates how connected we are in our experiences as human beings. Often when we feel most alone, we are surrounded by people who have gone through similar situations. Why do you think it’s important that organisations like City Year exist? It’s easy to answer that question, when I look at how much my life has changed since I joined City Year. I give people the benefit of the doubt now, I’m an active citizen, I understand the importance of voting. Organisations like City Year open your eyes, and make you realise how important it is to give back to your country. How important it is to share experiences with people, to help them become better. People need inspiration. Especially the kids that we work with. They need to know that they are not alone, and that there are people out there who understand what they are going through, and are willing to help. Seeing the difference that I make in my community. I’m privileged enough to serve in the community that I come from, so I can see the transformation every day. I still run into some of the kids that I served in 2006, who are now in matric, and I can see how much they have changed. My family motivates me. The fact that someone has made a difference in my life, motivates me to do my best to make a difference in other people’s lives. The fact that I’m alive and can get up every day to do what I love doing, motivates me. My mother’s legacy also motivates me. I learned to love serving because of the example that she set for me. Everyday I live my life trying to make her proud. This entry was posted in Staff and tagged city year, Motivation, Site Leader, Smash Shoyisa, Staff Birthday by City Year South Africa. Bookmark the permalink.